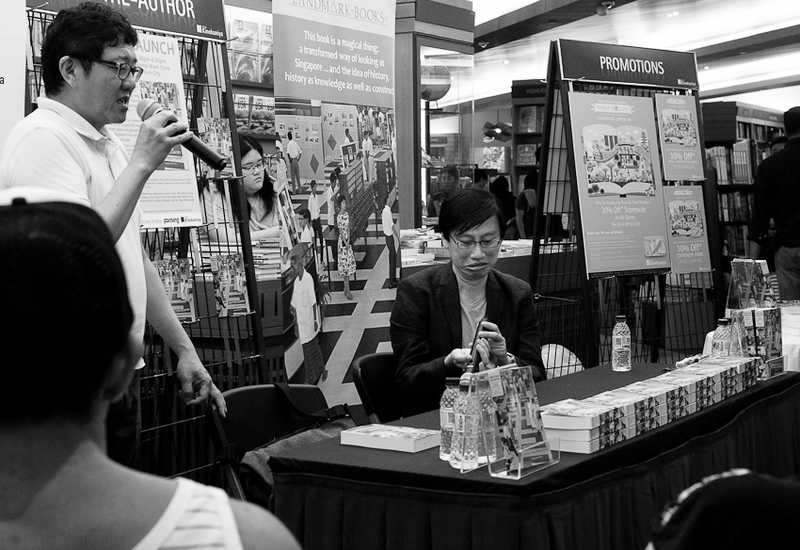 Written Country: The History of Singapore through Literature was launched at Kinokuniya last Saturday. The book is published by Landmark Books and edited by Gwee Li Sui. This anthology tells Singapore’s history through excerpts of prose and poetry. A brief informative commentary on key events from the fall of Singapore to the death of Lee Kuan Yew accompanies the literary texts. What is the quality that literature possesses that makes history come alive and something more than a list of observed facts and descriptions? In the very first text, Lim Thean Soo demonstrates this quality when he writes about the schoolboy who runs to the concrete roof of his family home to watch the shelling and counter shelling, and the bombs falling across Singapore on the 15th February 1942. Meira Chand read an excerpt from A Different Sky on the Hock Lee Bus Riots. The book also contains prose excerpts and poems from Alfian Sa’at, Robert Yeo, Said Zahari, Goh Sin Tub, Dave Chua, Christine Chia, Gopal Baratham, Stella Kon, Boey Kim Cheng, Felix Cheong, Toh Hsien Minh, Tania De Rozario and others. The book is a gateway drug encouraging the consumption of other works of leading Singapore writers. Landmark’s founder, Goh Eck Kheng, did not expect Gwee to do so much work editing the book. Gwee probably did not expect to do so much work either. He ended up looking at a ‘couple of thousand Singaporean English titles’ and whittled that down to 54 pieces. Gwee’s expression after the suggestion of another volume of literature covering pre-war events can be seen above. My only other question is where was the kachang puteh and potong ice cream? Speakeasy #25 was held on 12 Feb 2016 at Artistry in front of a warm and boisterous (now paying but its worth it) audience and featured a range of traditional, pop, contemporary, queer, and #SGLit poetry selected by the following talented poets/writers/impresarios/wannabe Lotharios/flaneurs/etc. Jennifer Champion: Kiki Dimoula's "Diabolical Coincidence", Andrea Gibson's "Love Poem"
Joshua Ip: Ann Ang's "Valentine for your Hair", Benzie Dio's "Stamford road" and Cheryl Julia Lee's "How We Make Love"
Becca D’Bus: as ever delicious and decadent, argued with herself over the boy being mine, and told us very clearly that children are our future. Shane wound down the ute’s side window and the dog rose and leant away from him. With its paws on the armrest, the dog poked its tongue out and sniffed. Shane laughed because he knew this joy. He’d done it himself: stuck his head out and felt the wind and sun on his face, a caress of light and air. Buy We Rose Up Slowly online here (free shipping in Singapore). Burn After Reading SG, a Singapore collective of young writers, presented a poetry evening with Cyril Wong at Artistry on 22 May 2015. Cyril shared several of his poems (including one of my favourites First Date) and answered questions. Cyril was in good form and talked about growing up on the concrete floor of a small HDB flat, the music in his poetry, darkness, getting to know Terry Jaensch, why he likes the Australian poetry scene, his ‘process’ (handphone note taking and sending SMSs to the self, collecting these wisps in a laptop each evening and letting the work grow from there) etc etc. Then Cyril sang a Chinese lullaby and we were taken to a completely different space. No wonder people were turned away at the door. The next BAR SG event is on 27 July 2015. On 20 March at Books Actually, Eric Valles and Desmond Kon talked about the craft of writing, their literary journeys and their poetry and prose. Both poets have been journalists and have strong theological interests that shines through in their work. Desmond spoke about his novel, Singular Acts of Endearment (Squirrel Line Press), which recently won an award at the Beverly Hills International Book Award. I really enjoy the rich, intricate, ambitious depths of Desmond’s fiction and poetry. I first met Desmond in 2010 at an NUS reading where he read some Haikus and I read my short story We Rose Up Slowly. Recently we caught the wrong bus from Speakeasy and I left him, late in the evening, stranded near a building site on the other side of One Raffles Quay. Eric talked about his poetry collection After the Fall: Dirges among Ruins (Ethos Books). He read a wonderful poem about the restoration of a mural in Changi prison. It was a very warm and pleasant evening.